The Shotgun Reload Ammo Pouch is a compact vertically mounted quick reload MOLLE pouch capable of holding up to (25) 3 1/2" 12 gauge shotgun shells. A quick pull tab is located on the upper flap of the pouch, once pulled you have immediate access to the first (9) rounds in the pouch. With the top flap open and first (9) rounds exposed, you can pull down on the pouch reavaling a tri-fold platform providing access to all (25) shotgun shells. Each shell is held in place, individualy, by elastic retention straps. The top flap is secured by velcro and also has additional snap buttons for additional retention (snap buttons can be bypassed). 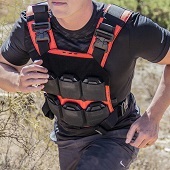 The Shotgun Ammo Pouch attaches via built in Molle Straps. Despite the supposed bad rap that Condor products seem to have, I have yet to experience any of them. A rugged, high quality product at a low price. As always, the test of time will tell but I don't foresee any problems with it in future. The Best, Smallest and Easy to Carry & Access 25 shells!! I will be getting some more of these! !